Little Falls Recreation Centre is located on Little Fall Road, south off of Highway #622. It is home of the golf course and four sheet curling rink. It also has kitchen and bar services as well as room and hall rentals. It can be booked for weddings, Christmas parties, intimate family dinners, or a barbeque with the gang after a round of gold. Whatever your occasion may be call the centre at 807-597-6638 or the Community Services department to reserve. As one would expect, the golf course named Little Falls Golf Course features a picturesque view of the water falls from our signature Hole 7. Be prepared to add a few strokes to your games as you make your way through the challenging and beautiful course of rolling hills, off camber shots, and creek crossings. Little Falls Golf Club hosts the Men`s M & C Motors Golf Tournament, the Ladies Celestial Gold Golf Tournament, Senior Men`s Tournament and is the host site for the Future Links Program. All of these events are open to the general public. Little Falls Curling Club offers a four sheet rink. The Club has been a host sight for the Men’s Tankard, the Ladies' Scott, the Junior Play Downs and the Mixed Provincials. 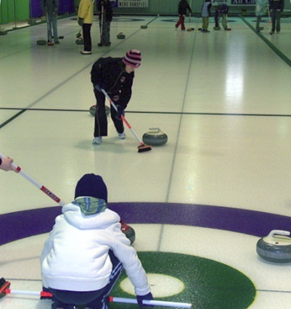 The Little Falls Curling Club features Men’s and Ladies' Curling, Little Rockers Curling Program, afternoon curling and has been included in the Atikokan High School Sports curriculum. There are many Bonspiels throughout the curling season and new curlers are always welcome. Please contact the Community Services Department for more information.